Announcement Spend $40 and receive FREE Domestic SHIPPING! Spend $40 and receive FREE Domestic SHIPPING! Thanks so very much for the roller, I absolutely love the scent. I think I said before I’ve been specifically looking for the OM blend and was having trouble finding one I liked. Thanks again! My adult boys love this shave soap! We keep buying the bowls but refills are available too! Love this shop! Fast shipping! Packed well. Smells wonderful! Hanalei Bath is always such a pleasure to shop with! I love the charcoal bars. I have completely given up chemical based face washed and exclusively use this bar! 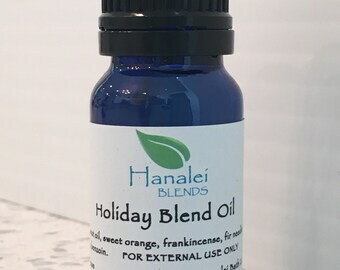 Making our Holiday essential oil blend today. It’s an aromatic blend of everything Christmas in a bottle. Bath Bomb trios are packed up and ready to ship out. Your free gift with a $40 order during our Black Friday-Cyber Monday event! Blending more Relax essential oil blend. Mahalo for your interest in Hanalei Bath! Hanalei Bath aromatherapy products are inspired by the beauty and earthy, pure vibe of Hanalei, an enchanting town in Kauai, Hawaii. Our mission is to make the incredible sensory benefits of essential oils and gentle-on-your-skin, natural bath and body products attainable for everyone to enjoy. Hanalei Bath Founder and Certified Aromatherapist Jana Rife holds more than 20 years of experience in aromatherapy. She has studied under some of the leading experts in the field, including Gabriel Mojay of the International Federation of Professional Aromatherapists, Mark Webb of AromaMedix and Roz Zollinger of Heal Center. •	Our ever-expanding product selection includes aromatherapy facial and room sprays, essential oils, body and foot creams, soaps, bath salts and fizzes, lip balm, all-natural bug spray and more. •	Every essential oil—many organic or ethically farmed—that goes into our blends is handpicked based on its specific therapeutic qualities. •	Our handmade, natural soaps don’t contain detergents that can irritate your skin. •	Several of our ingredients are so good for your skin, such as vitamin E, rice bran oil and avocado oil, to name a few. 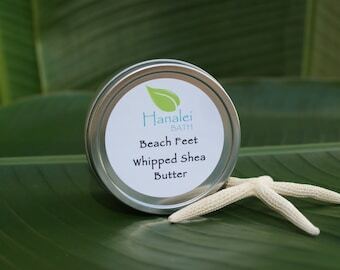 •	The silky-smooth and never-tacky Whipped Body Butter with Shea is our top seller—try it! Aloha! I am an Aromatherapist and the creative force behind Hanalei Bath. I have been using essential oils for 20 years to craft my own bath and body products. It was my love for the oils, craft, and my passion that drove me to create Hanalei Bath. Find HanaleiBath at the following upcoming market! Atlanta Aromatherapy - Free Pickup By Appt. Free pickup or shop, just contact us to set up a time. Enjoy a sensory journey and learn more about aromatherapy. Aloha! At Hanalei Bath we are committed to providing you with the best possible bath and body care experience. We make all our own products using the finest available oils and ingredients. We are committed to providing the best care and service to our customers. If you are not satisfied with any of our products, we are happy to refund your purchase price. Simply return the unused portion of a product within 30 days for a full refund less shipping charges. 1. Notify us by email of your return. Please DO NOT send any products back without contacting us first. 2. Please enclose a copy of the invoice or packing slip along with the product. 3. We will refund your amount in the method of payment used to make your purchase. Hanalei Bath charges sales tax for merchandise ordered on this Web site based on the applicable state sales tax rate and the Georgia location to which the order is being shipped. Hanalei Bath ships products internationally. The risk of loss and title for all merchandise ordered on this Web site pass to you when the merchandise is delivered to the shipping carrier. All duties, taxes, and any additional fees are the buyers responsibility. Most orders ship within 48 hours of receipt, Monday through Friday. Disclaimer: The statements presented on this site have not been evaluated by the Food and Drug Administration. The use of herbs for the prevention or cure of disease has not been approved by the FDA or USDA. I therefore make no claims to this effect. The products offered on this web site are not intended to diagnose, treat, cure or prevent any disease. Aromatherapy is the art and science of using pure essential oils to promote balance and wellness. An Aromatherapist is not a doctor and cannot prescribe, diagnose, or treat any specific condition. Essential oils assist the body in returning from an unbalanced state, which can lead to illness, to an ideal balanced state, which is health. Aromatherapy is NOT a substitute for medical care. Aromatherapy does not require that you stop medication prescribed by a doctor, or that you refuse the care of a doctor. Our products contain various oils, butters, and other natural ingredients. Please be aware that Hanalei Bath is not responsible for any allergic or other adverse reactions. Please contact us before purchasing if you have any questions about our products. Contact us if you would like a custom aromatherapy blend or product for a special occasion. 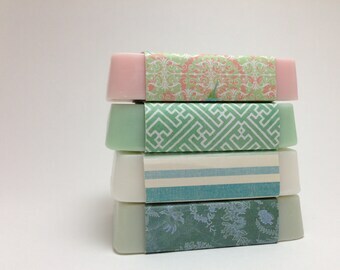 We can create adorable wedding and baby shower soap gift sets.